A pair of diamond earrings that feature glittering diamonds set into the centre for lustrous texture and glamourous wearing, perfect for completing the evening look. 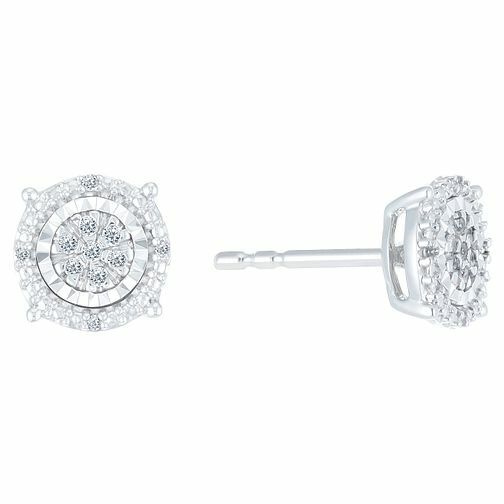 9ct White Gold Diamond Stud Earrings is rated 4.9 out of 5 by 19. Rated 4 out of 5 by Anonymous from Well received gift So many diamond studs manage to look cheap and nasty. These don’t! Rated 5 out of 5 by Anonymous from Recommended!! Good quality and really warm :) My hubby got these fabulous studs for my birthday and I just loved them. They are perfect for daily and party wear. Beautiful and elegant design.